The last holdouts generally finish calving by the middle of May. During the month of May and June, the pairs are taken out to pasture. The Harding Ranch is cross-fenced in such a way that there are 20 separate pastures of significant size. The largest of these pastures is almost six sections. The month of May is also a busy time because each of the 1,000 calves has to be branded and vaccinated before heading out to summer range. 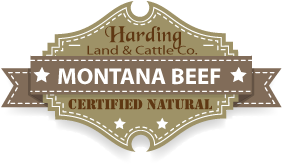 Harding Land & Cattle Company uses a branding table and a crew of five workers to brand all of its calves. All of the cattle work carried out on the Harding Ranch is done with the use of horses. During the spring, fall, and summer months, horses play a big role in the ranch operation. The Harding Land & Cattle Company employees at the ranch are careful to take good care of their string of horses, since few cowboys are very fond of riding a horse that is already tired and worn out from the previous day’s work. Each employee at the ranch tries to keep a string of at least 3 sound horses during the times of heavy use. As breeding season approaches, the ranch employees at Harding Land & Cattle Company gather the RanchStar™ herd and prepare to sort them into their different breeding groups. In recent years, the Harding’s have moved away from single sire breeding to managing the genetics in a more global way. Both the Ranchstar and commercial breeding stock is divided into to groups. The bulls are selected for the entire group by looking at genetic data sucha s birth weights, weaning weights, adjusted 205 weaning weights, and production history. This insures that the chances of losing quality due to poor genetic combinations is minimal. These breeding groups require close attention during the breeding season to make sure that the bulls are healthy and in the pasture they are supposed to be in. In this respect, the RanchStar™ program is very similar to other registered programs in that very close records are maintained. The commercial cowherd is handled in the conventional way during breeding season, and is exposed to multiple bulls. The RanchStar™ bulls are turned into the pastures on June 20 at the rate of 15 to 25 cows per bull. As the summer progresses, employees at the Harding Land & Cattle Company ranch settle into the regular summer routine of checking and fixing fences, putting out minerals, maintaining the water systems and monitoring the forage levels in each pasture where the cattle are. The ranch has had many improvements in the form of water availability. Miles of waterline have been installed to better utilize grass in all areas of the ranch. Many of the water troughs are kept full using gas and propane-powered generators. These generators are mounted on mobile trailers and are pulled to various well sites around the ranch. From these well sites, the generators pump the water into strategically placed cisterns, from which the water flows to the different troughs as needed. It takes some practice to be able to gauge how the timers on the generators should be set to run in order to fill up the cisterns without needlessly wasting water through the overflow pipe. 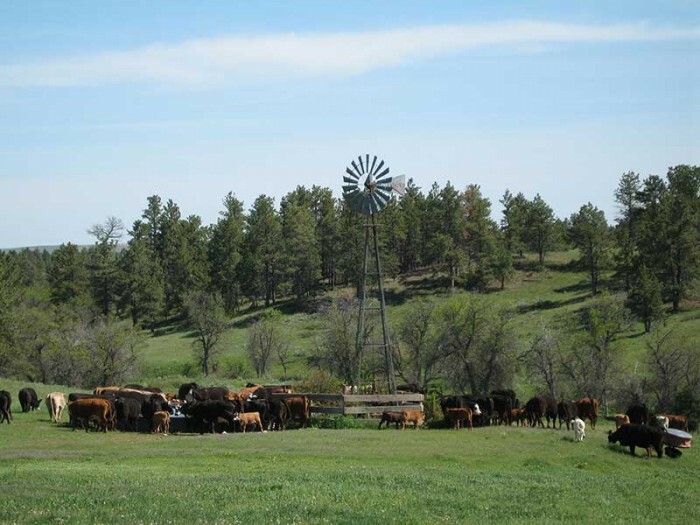 Around 13 windmills are also scattered throughout the Harding Land & Cattle Company ranch. There are always certain issues that arise to interrupt the normal summer routine. There may be an injured bull that needs to be loaded into a trailer and brought home. A cloudburst from a thunderstorm could have washed out a water-gap (spot where the fence crosses a creek). Every rancher always keeps a vigilant gaze on the horizon when dry thunderstorms pass over, for fear that a fire may have started somewhere. The Locate Creek meadows are usually harvested for grass hay sometime in early to mid-July. Much of the hay here is put up in small squares for use during calving season. The hay is all grass, mostly brome and crested wheat, and the yields are usually from 1 to 2 tons per acre.